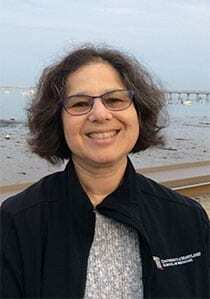 Rena Feinman, Ph.D., is an Associate Member of the Center for Discovery and Innovation. Our research seeks innovative and novel strategies to improve response to anticancer therapies. The discovery that compositional differences of the gut microbiome contribute to the heterogeneity of the immune response to chemotherapies or immunotherapies has prompted us to investigate the influence of the gut microbiome on antitumor immunosurveillance in patients with multiple myeloma (MM) who have been treated with consolidation therapies in the post-transplant setting and in newly diagnosed patients with triple-negative breast cancer treated with standard of care neoadjuvant chemotherapy. To complement our translational studies in MM, a major effort has been made to understand the bidirectional relationship between gut microbiota and immune cells in influencing MM progression and response to combination therapies in a clinically relevant mouse model of MM. These studies will hopefully identify novel microbiota-associated immunomodulatory biomarkers that predict response to combination therapy, disease-free survival, and overall survival. The clinical relevance and translation of our study will provide clues for optimizing therapeutic outcomes for the heterogeneous responses of MM and TNBC patients to anticancer therapies. A second area of interest in our lab is understanding the mechanisms responsible for early, conditioning-related intestinal injuries that contribute to the initiation of gut graft-versus-host disease (GVHD) and determine how subsequent gut-specific epithelial pathology disrupts intestinal homeostasis. We are studying the gut-protective roles of hypoxia-inducible factors and the therapeutic role of intestinal stem cells in mitigating GVHD severity in several allogeneic bone marrow transplantation (BMT) mouse models.